A friend once suggested an excellent tip when taking photos of food: “Take better photos by maximizing the sunlight. 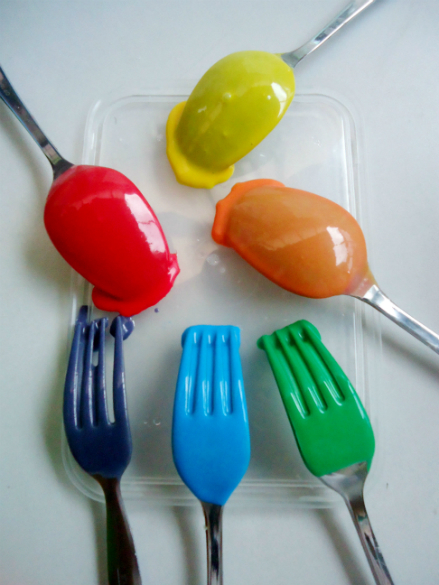 It will show the natural colors of the food and drinks you prepare”. If you’ve noticed in my recent blog posts, I did my best to apply this tip by cooking and/or baking while documenting the process during the day. 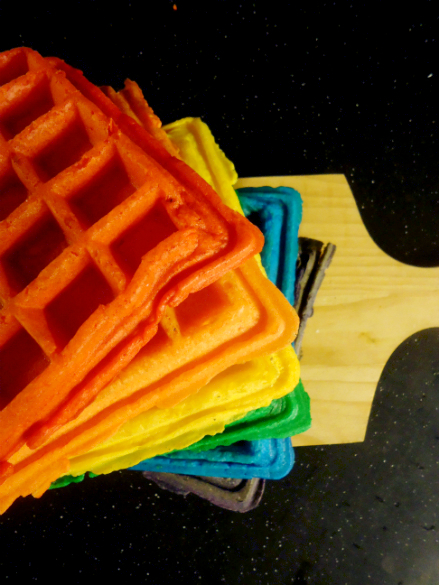 However, when I was about to make rainbow waffles for our afternoon snack yesterday, I fell asleep and woke up four hours later! It was already past 5 pm when I woke up and the sun was starting to set. 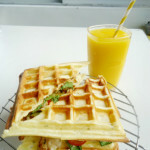 I hurriedly prepared the ingredients and cooked the waffles while trying to take photos of them in the daylight. But, halfway through the process, the sky was getting darker and by the time I finished the waffles, it was already past 6 pm. 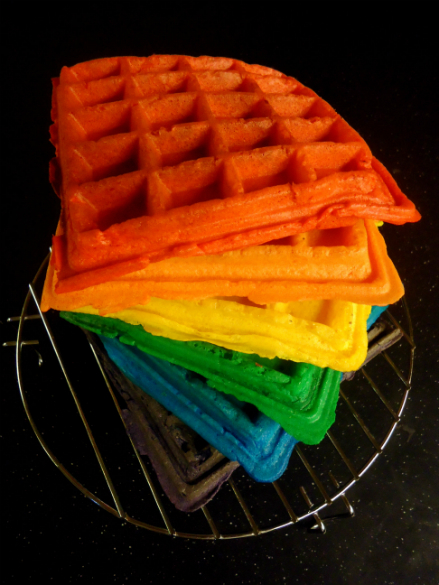 I felt a bit discouraged because I was really looking forward to taking photos of the rainbow waffles in the sunlight. The photos would have looked better that way. After a few minutes, I decided to bring them inside and I placed them on our breakfast table. I got our camera and took one photo at a time. 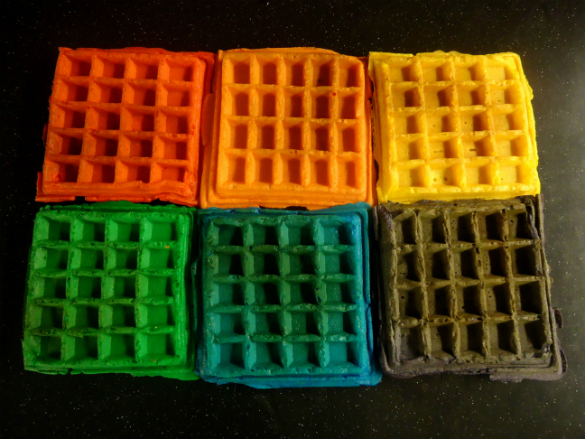 As I arranged the waffles and captured different angles, I noticed how well the rainbow colors complemented the black table. 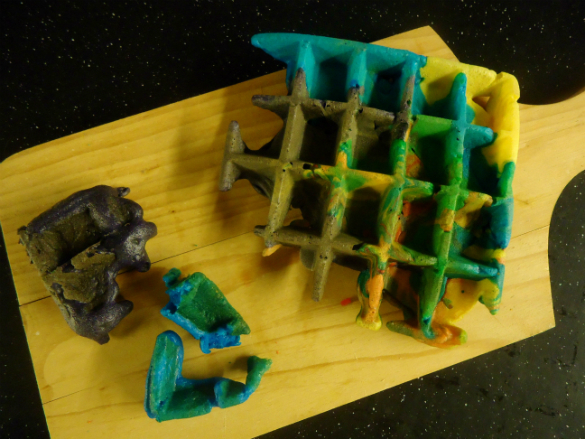 Because of the dark background, the bright colors of the waffles stood out more and the effect was quite lovely. Even though I felt that it would be a much better idea for me to take the photos in the sunlight, I realized that God had something amazing in store for me. He wanted me to appreciate the set of rainbow colors by seeing its beauty in the dark. 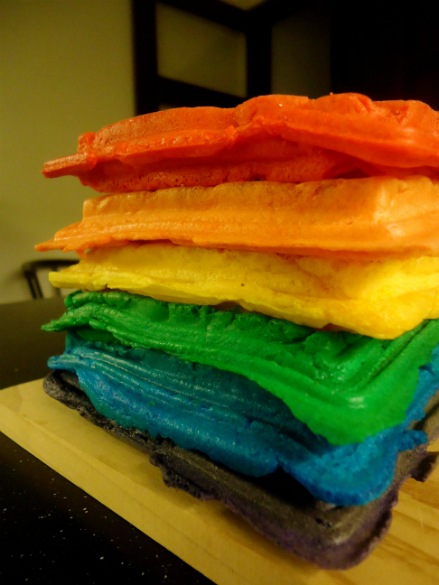 This reminded me of the reason why I decided to make rainbow waffles. It was my simple way of celebrating one of God’s blessings for me recently. For the past months (or even year), I got discouraged with certain aspects in my career. I struggled with my mistakes at work, temptations to complain and compare myself to others who have “better opportunities”, finding my self-worth in God and not in my financial resources, and many more. Despite these and some discouraging moments that I had, God encouraged me to keep on praying for wisdom, excellence and direction at work. He allowed me to focus on His goodness, power, and grace in my career instead of on my weaknesses. By God’s grace, just a few days ago, my bosses evaluated me and told me that I got promoted! It was really all by His grace! After spending time with God, I realized that He wanted to humble and prepare my heart first before giving me more responsibilities and blessings. 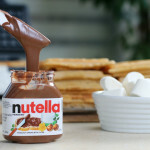 It’s interesting how he answered one of my heart’s requests AFTER committing to fast from shopping for a year (http://encouragingtreats.com/year-shopping/) and after choosing to honor Him with the finances that He has blessed me with. 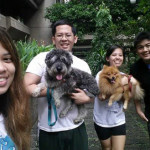 A year ago, I thought that having a salary increase or a promotion would make my life better, easier, and lovelier. But, God changed that wrong mindset in me and encouraged me to see my worth not in my work, in my salary, in the things I have, but in Him and Him alone. 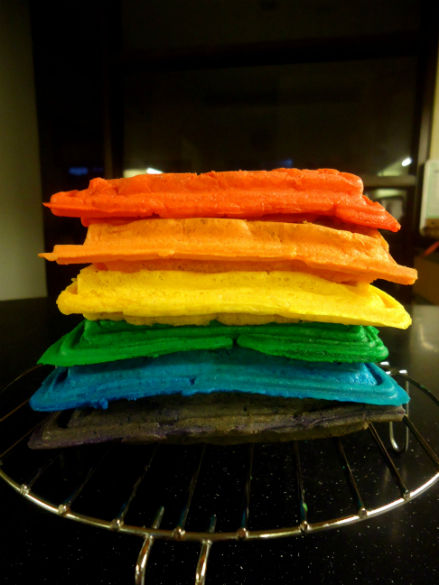 God helped me see the beauty of the colored waffles even without the sunlight. And in the same way, He allowed me to appreciate the beauty of His love, faithfulness, and sovereignty even without the things that I thought would make my life better (e.g. salary increase, etc.). *Optional: You may add Cinnamon powder, sliced bananas/strawberries/mangoes, chocolate chips, and crushed nuts. 1. Combine dry ingredients in one bowl and the wet ingredients in another bowl. 2. Gradually add the dry ingredients to the wet mixture while stirring. 3. 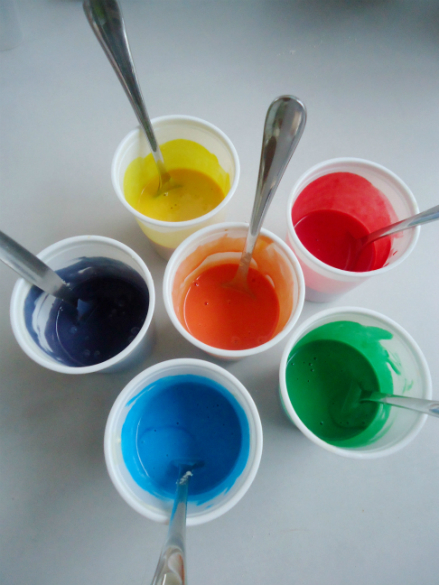 Divide the batter into the desired number of colors. 4. 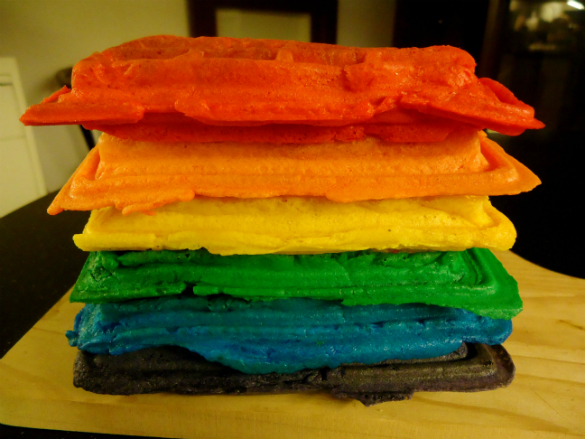 Add food coloring and mix until well-combined. 5. Cook in a waffle maker. 6. Serve with pancake syrup, fresh fruits, and whipped cream! This post really encouraged me! Just like what you’ve experienced, I used to think promotion, hot skills, opportunities and salary increase would make me happier. Di naman masama na maghangad ng mga bagay na ito, but when these things start to take God’s place in our lives, that’s when we become miserable – we find security and happiness in material things, we compare ourselves to others, we forget to be grateful with what we already have, etc. I believe work is a blessing/provision from God. But work cannot replace God. Ang galing talaga ni God. And I agree dun sa sinabi mo na: “I believe work is a blessing/provision from God. But work cannot replace God.” Nakakahumble talaga ito. Thank you for encouraging me as well. :) I pray that He would bless your heart even more as you walk closely with Him. See you around!